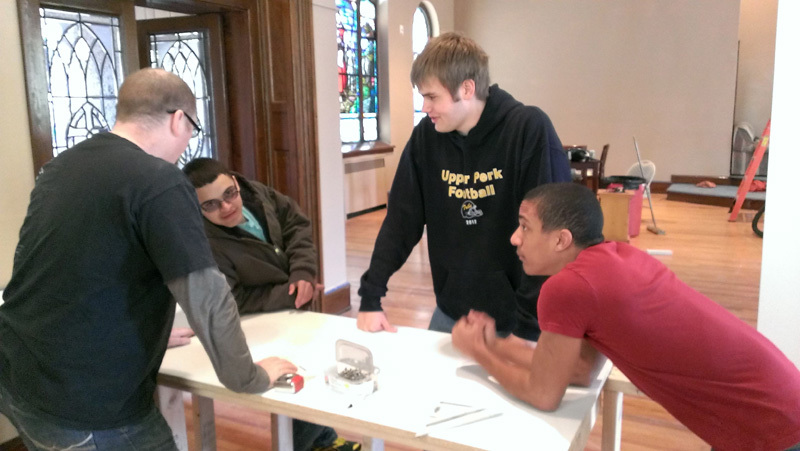 Scott Roth works on the East Greenville building with Tyler, Cory, and Darian, students from Upper Perk high school. Photo by Tyler Logan. The moment that Scott Roth unlocked Peace Mennonite’s old building for the first time in September of 2012, he began to tear up. One of the high school students with him asked why he was so emotional. “I can’t believe this is actually happening,” he responded. The journey to open what is now Project Haven, a community center in East Greenville (Pa.), had been long and circuitous. Roth, youth pastor of Eastern District Conference’s New Eden Fellowship, had been a part of UPPEN (Upper Perk Prayer & Evangelism Network) and the regional ministerium for years. In 2011, these groups faced a community crisis when a high school student committed suicide. 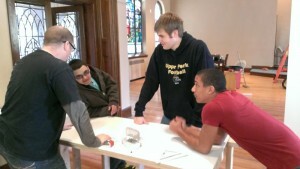 Leaders from the groups met with reprentatives from Upper Perkiomen School District to find out how they could help. The school district wanted an organization that could be connected with all the major players in the community: school, police, faith communities. And they needed this organization to provide an afterschool program, some sort of a community center that would not just entertain the students, but help to develop character and provide a calm in the storm of their lives. 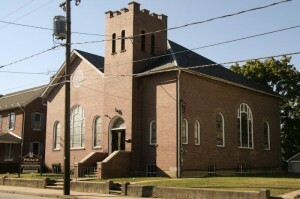 Peace Mennonite’s old building in East Greenville, Pa., has been repurposed into a community center. Meanwhile, Franconia Conference’s Peace congregation decided to close. The members of the congregation, who had been active in their community, wanted the building to be used to continue God’s work in East Greenville. Even as they grieved the end of their congregation, they believed that new life would result. They chose to celebrate their last service together on Easter 2011, dreaming about what God would resurrect in their space. Peace’s LEADership Minister, Jenifer Eriksen Morales, called a meeting of leaders from local congregations—some Mennonite and some from other denominations—to have a time of visioning together. The leaders met, prayed together, looked at the building, and dreamed about what God might want to do in that place. Seeds were planted and some of the pastors began to think about how their existing ministries might find a home in the old church building. Even as the pastors were meeting and dreaming, Roth and team of leaders from New Eden were starting an afterschool program called Refuge at the Upper Perk high school. The space was not entirely conducive to the type of activities Roth wanted to do with the students and he continued to look around for a new space. After months of searching and uncertainty, Roth’s dream and the East Greenville building collided. 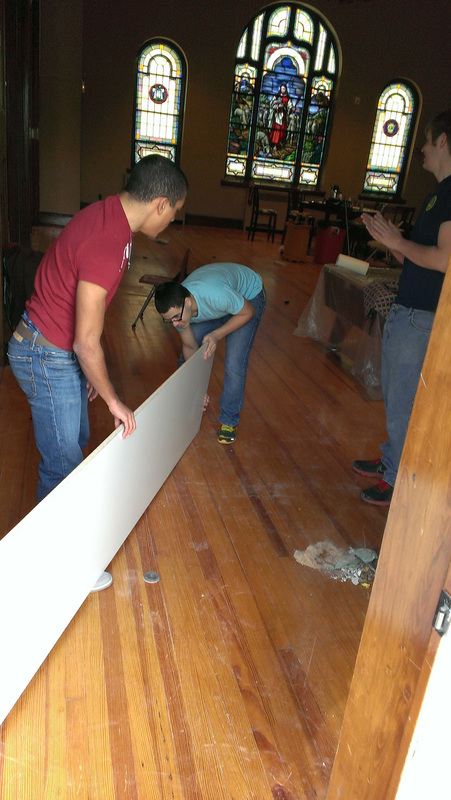 As soon as plans were finalized, Roth began working with a team of student volunteers from the high school to renovate the building. He formed an advisory team with leaders from his own church and Franconia Conference’s Finland and Perkiomenville congregations. Soon other dreamers began to show up with ideas: the local senior center asked to move into the building and use it weekday mornings when the students were still in school; members of the former congregation joined Roth with ideas of ways to rejuvenate their existing clothing ministry; a member of Family Worship Center organized a bar alternative to utilize the space on Friday and Saturday nights. In March—just in time for Easter—Project Haven will move into its new location: three blocks away from the local junior high school and five minutes from the senior high school. While the project still needs supplies like tables and chairs, volunteers for continuing renovation, and financial donations for their ongoing work, Roth is amazed at how God has brought together people and resources so that this dream could come to life.